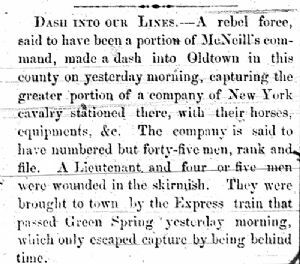 —A rebel force, said to have been a portion of McNeill's command, made a dash into Oldtown in this county on yesterday morning, capturing the greater portion of a company of New York cavalry stationed there, with their horses, equipments, &e. The company is said to have numbered but forty-five men, rank and file. A Lieutenant and four or five men were wounded in the skirmish. They were brought to town by the Express train that passed Green Spring yesterday morning, which only escaped capture by being behind time.